The weather has finally turned here in the Ozarks. Autumn is finally here! And with the change in temperatures, I've gotten a hankering for baking. A bit about myself... I'm what you may call a "foodie". I love food! Most of all, I love nice, long, leisurely meals spent with loved ones, engaged in wonderful conversation over good food and drink. Food is an important part of our family culture. I have learned over the years, though, if not done "properly", it can have negative consequences on the health and shape of one's body, which is exactly where I found myself not too long ago. Almost a month and a half ago, DH and I embarked on a new food journey (as I may have mentioned previously), a new way of eating. One thing I've struggled with is my old "diet" mentality. While it's my desire to gain a healthier, stronger and more pleasing shaped body, I know the "diet" mentality doesn't work for me. If it did, I would not be where I am today. This is a new way of being. It's something I have to remind myself of quite often. Years of learning has taught me "that which I resist does persist." And while I am done having an unhealthy body, I know, if I'm to be successful, I need to focus on the positive aspects of what I desire while making changes in my way of eating and be-ing with food. The Ketogenic way of eating is assisting me with this. Now, this is not a post to convince you that "my way is the right way". It is, however, right for myself and DH. I love that food that tends to be demonized (ie butter, eggs, cream, etc) are among the staples. One thing that I have been having difficulty with, though, is baked goods. I love baked goods! But, traditionally, they're quite full of carbs (and not all 'good'/fiber filled carbs). The sugar filled carbs are the things we avoid with the Keto way of eating. Fast forward to the past few days here in the Ozarks. With the turn in weather, my mind and heart have turned to... You got it! Baking! Blueberries... Not so bad on the carb scale where fruits are concerned. Doable. Just have to go easy on them. Scones, though... Could be dicey. 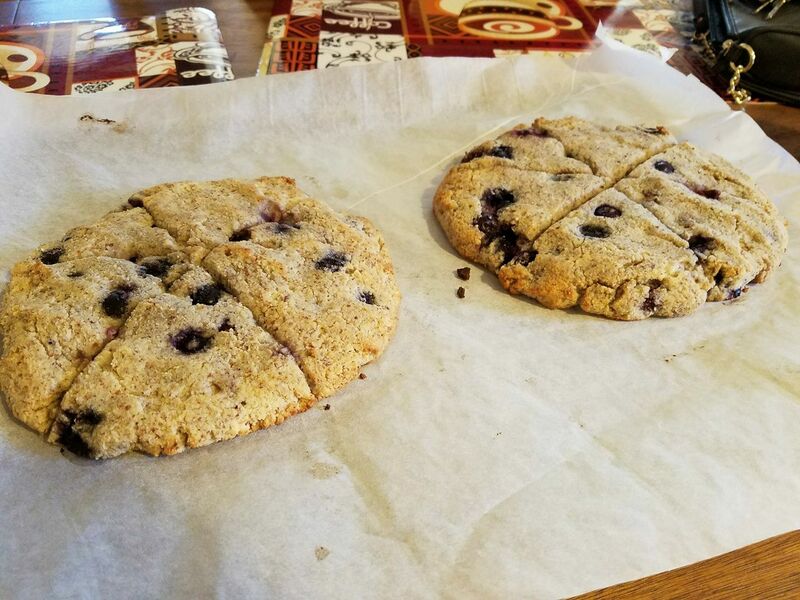 I did, however, find a recipe for Low Carb Blueberry Coconut Flour Scones this morning, and they came out looking and smelling so good! Sometimes, even when working to gain our "ideal" bodies, we have to take the time to be creative and find ways that we can "splurge" and enjoy the good things in life. That is what life is about. Not deprivation or suffering. A life filled with those things - especially when they are self-inflicted - is not sustainable. Or, if it is, what's the point in it? We are meant to be our own best friend. After all, we are the only person that is with us from the moment we take our first breath until our very last. We are the one person in this whole world that we should be able to count on. A scone and tea (with cream) is just a little way that I can be kind to myself later today. What will you do to be kind to yourself? The picture to the left is one that I came across via a "friend" I follow on Facebook. Lisa Hutchison, LMHC. It conveys what occurs for me and has occurred for me for many, many autumns now. I just hadn't realized that's what I've done in such a clear manner until now. I have known since the beginning that 2017 is a '1 year'. A year of beginnings. It has not reflected that energy to me. That is, until recently. Guess it's a late blooming energy in my life. Or maybe I'm just the late bloomer. lol Either way, it is beginning to "kick in". But will wait until late December to fully materialize. As mentioned previously, my family is facing a transition, in the form of a move. This has been requiring us to go through and "purge" those things that no longer serve us. And, let me tell you, there has been A LOT of it! I've lost track of the number of trips we've made to the local charity thrift store to make donations. But, I have realized that the "purging" doesn't end there. I am undergoing something of a "reboot" of self, both physically and mentally. To be honest, I'm not entirely certain how it's all going to play out. Physically, I'm beginning to feel better than I have in quite a long time. But even that change isn't merely physical. I'm beginning to feel better about me. More motivated and optimistic, and in a way I've not felt in years, if not decades. See, Dh and I have embarked on a ketogenic way of eating. Granted, it's only been 2 weeks now, but I'm feeling GOOD, if not still a little tired physically. I'm noticing changes in my weight and my body as well as a desire to move my body. I've finally found a form of exercise that I enjoy, that I can easily convince my mind that "we're having FUN!". It took me some time to get beyond the insecurities. Truth be told, they still come up at times. (ie visions of the dancing hippos in Disney's Fantasia) BUT, I'm not allowing them to deter me, and I'm having a great time with it! Not only at class each week, but in the videos that I work with throughout the week to strengthen my body. Will I ever be a prima ballerina? No. I probably won't ever make my way to being en pointe, but I'm enjoying the heck out of it! And am very much looking forward to being a part of the studio's production of The Nutcracker in December. Reflection upon mySelf, purging of the thoughts and programming that no longer serve me, and transformation into who I AM authentically... That is what this autumn is all about. Now, more than ever.